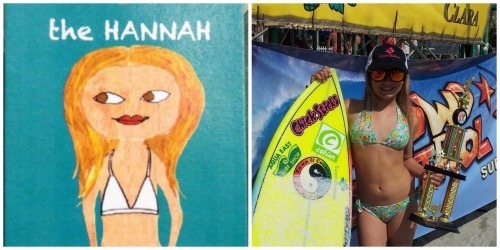 When Hannah Blevins’s best friend Kiah Hutcherson talked her into signing up for surf camp, she didn’t think it would be something she would really like much less an event that would change her life. She was hooked after catching her first wave and hasn’t stopped catching them since. I met Hannah and her mom Sherry at the Si Como No Inn, where she was volunteering as a CIT (counselor-in-training) for North Beach “Spring Break” Surf Camp. At 11 years old she has already experienced a full circle in her surfing career, as she is now helping kids learn to surf. It can be safely presumed that whatever goals Hannah sets…she is going to succeed. Here’s an inside to what makes this young lady tick. Farley Boyle is confident her target customer will take to Squirtini Bikini like a fish takes to water. And Boyle knows a thing or two about swimwear and the discriminating tastes of girls. It was no surprise then, when her three active daughters — with very different fashion personalities and body types — couldn't find what they wanted in swimwear, that Boyle dove right in to the rescue, creating Squirtini Bikini. Committed to designing swimwear that is functional, fits well and is fashion-forward, Boyle pumps up the appeal of her line even further by giving girls — and retailers — endless fashion possibilities. Tops and bottoms are designed to be mixed and matched. Boyle also entices customers with a group of core basic colors, allowing girls to buy additional pieces to change up their two-piece looks. Some pieces are reversible as well, creating another level of added value. The debut collection features 16 different styles cut to offer the best coverage and fit for girls. One-piece suits, rash guards and trendy cover-ups are also included. Targeting girls' sizes 4-16, Squirtini Bikini wholesales from $15-$38. May 2012 - Squirtini Bikini is a fashion-forward young girls & TWEEN swimwear line, created to fill a void in the junior marketplace by designing flattering, feminine swimsuits that cater to the continuously evolving & changing girl’s/TWEEN body, mind and spirit, in all phases and stages. Squirtini Bikini was conceived when two Floridian moms, both former models, discovered that they had difficulty finding unique yet modest, HIP yet feminine swimsuits to outfit their daughters. Inspired by their children’s different body types and personalities Farley Boyle and Haven Beach launched Squirtini. The duo designed and named their initial silhouettes after their daughters’ and were lucky enough to have built-in models when they shot their first collection. This sweet fashion forward brand keeps girls age appropriate when the desire to express individuality becomes important. With mix- n-match opportunities in multiple silhouettes personal style can shine. Thanks to Squirtini Bikini, girls of all ages can be carefree, comfortable and confident in their own skin. For more information please contact Farley Boyle. Hermosa Beach, CA – November 8 2012 - Virtual Piggy, Inc. (OTCBB: VPIG) announced today that it has signed an agreement with four fashion companies specializing in products for young girls, and tweens: Squirtini Bikini, Hudson Threads, Stella and Pink Chicken. All of these brands will soon offer Virtual Piggy’s innovative safe youth payments technology on their ecommerce website. Virtual Piggy allows parents to set up a monthly allowance for their children and promotes financial management while empowering U21s to make purchasing, saving and other money management decisions for themselves, within the boundaries setup by their parents. Squirtini Bikini is a fashion-forward young girls and tweens swimwear line, created to fill a void in the junior marketplace. Squirtini Bikini was conceived when two Floridian moms, both former models, discovered that they had difficulty finding unique yet modest, hip yet feminine swimsuits to outfit their daughters. Inspired by their children’s different body types and personalities Farley Boyle and Haven Beach launched Squirtini. Hudson Threads is a New York based girls brand specializing in tween clothing. The collection prides itself on offering styles that are both fun and easy to wear, and is available in sizes 4-16. Aside from their online store, Hudson Threads can also be found in retail stores across the country, in addition to Canada, Puerto Rico and Japan. Stella offers hip, comfortable clothing for ages 12 months to 16 years with lots of handmade touches and thoughtful details. The company strives to be sustainable by minimizing packaging, and sourcing materials and manufacturing close to home. The clothing is designed and produced in Los Angeles, California. Pink Chicken is based out of New York, offering clothing for newborns, kids, tweens, and women. Their brand has been featured in magazines such as Vogue, TimeOut New York for Kids and Hamptons Magazine. The children of Nicole Richie, Dave Grohl, Jennifer Garner, Tobey Macguire and Tori Spelling have been spotted wearing Pink Chicken clothing. All statements in this news release other than statements of historical facts are forward-looking statements within the meaning of the “safe harbor” provisions of the Private Securities Litigation Reform Act of 1995. These statements are based upon our current expectations and speak only as of the date hereof. Although we believe that the expectations reflected in our forward-looking statements are reasonable, we can give no assurance that such expectations will prove to be correct. Such statements are not guarantees of future performance or events and are subject to known and unknown risks and uncertainties that could cause our actual results, events or financial position to differ materially and adversely from those expressed in such forward-looking statements. Such factors include, but are not limited to, our ability to raise additional capital, the absence of any operating history or revenue, our ability to attract and retain qualified personnel, our dependence on third party developers who we can not control, our ability to develop and introduce a new service to the market, market acceptance of our services, legislative, regulatory and competitive developments addressing licensing and enforcement of patents and/or intellectual property, general economic conditions, as well as other factors set forth under the caption "Risk Factors" in our Annual Report on Form 10-K for the year ended December 31, 2011 filed with the Securities and Exchange Commission, and other filings with the Securities and Exchange commission and other public documents and press releases. Squirtini Bikini featured under “News Report” on KidStyleSource.com.